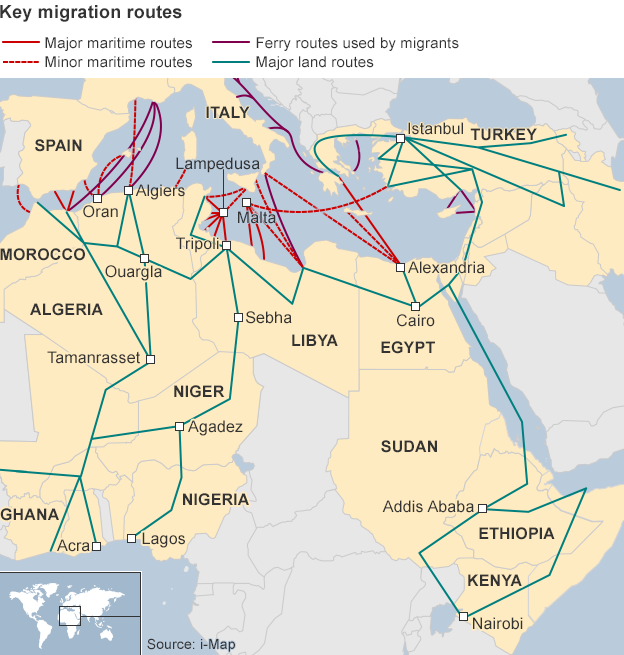 According to Italy’s transport ministry, four men with Kalashnikov rifles sped out from the Libyan shore during the rescue and ordered the coastguard to return a boat that had been emptied of migrants. Some of the gunmen then jumped onto the boat and took off with it, added Transport Minister Maurizio Lupi. The UNHCR says almost 3,500 people died attempting to cross the Mediterranean Sea to reach Europe in 2014, making it the world’s most dangerous sea crossing for migrants trying to enter the European Union. More than 200,000 people were rescued during the same period. Many were plucked from the sea as a result of an Italian operation known as Mare Nostrum, which was launched in October 2013 in response to a tragedy near Lampedusa in which 366 migrants died. That operation has now ended, leading the UNHCR to warn EU leaders to expect more deaths. Some European countries, including the UK, have said a rescue service for migrants could encourage refugees to continue making the crossing. The EU now runs a border control operation with fewer ships, called Triton, which only covers waters close to Europe’s coast. Posted on 16th February 2015 by newsafrica. This entry was posted in Africa, EU, Human Trafficking, Italy. Bookmark the permalink.